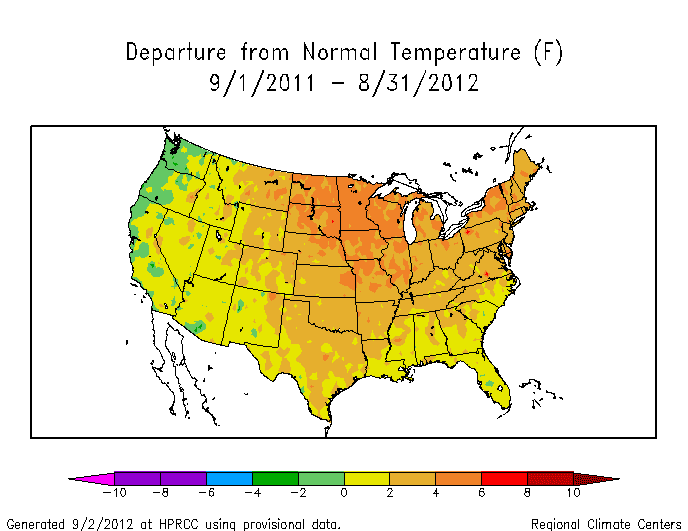 September 4 Update: The preliminary NCDC adjusted average for August is 1.2° above normal. This keeps summer 2012 on track for the second hottest on record in the U.S. All 9 regions except for East North-Central were above average in August. CapitalClimate analysis of preliminary National Weather Service data shows that the week ending September 1 was the 38th consecutive week of above-average temperatures in the contiguous 48 states of the U.S. The unadjusted average of temperatures from 215 NWS stations was 3.9° above climatology, up significantly from the geographically adjusted 0.8° the previous week. 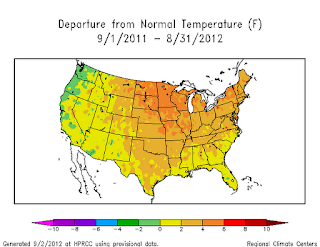 The very warm final week of August capped a month in which the overall preliminary temperature was 1.3° above average. If this holds through the National Climatic Data Center (NCDC) analysis, the monthly average of 74.8° would be tied for the 10th warmest August, just behind 2010. 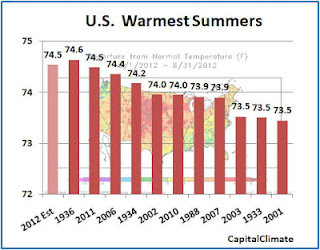 Combined with the record hottest July and warm June, the summer estimated average of 74.5° would be tied with 2011 as the second hottest on record, 0.1° behind 1936. 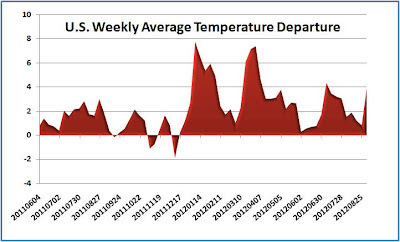 For the year to date as well as the past 12 months dating back to September 2011, average temperatures have been warmer than normal nearly everywhere in the country except the immediate Pacific Northwest coast. The warmest temperatures relative to average have been in the upper Midwest and northern Plains.